Deb Kilpatrick is the CEO of Evidation Health, a digital health company backed by B Capital, GE Ventures, SV Health Investors, Sanofi Ventures, Asset Management, and Rock Health. The Evidation platform helps the world’s most innovative companies understand and measure the everyday behaviors that drive better health outcomes. 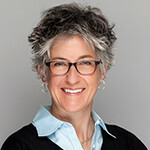 Previously, Deb was Chief Commercial Officer of genomic diagnostics company CardioDx, and she formerly held multiple roles at Guidant Corporation, including Research Fellow, Director of R&D and Director of New Ventures. She chairs the Georgia Tech College of Engineering Advisory Board and is a Fellow of the American Institute of Medical and Biological Engineering. Deb has been named to FierceBiotech’s Top Women in Biotech, FierceMedicalDevice’s Top Women in Medtech, and Silicon Valley Business Journal’s 100 Women of Influence. She has BS, MS and PhD degrees from Georgia Tech.